The most devastating consequence of the spread of American culture across the globe has not been our golden arches or our bomb craters, but our bulldozing of the human psyche itself. American-style depression, post-traumatic stress disorder, and anorexia have begun to spread around the world like contagions, and the virus is us. The term PTSD (Posttraumatic Stress Disorder) was new to Sri Lanka until the Eelam War broke out. The armed conflict that erupted between the government forces and the LTTE (The Liberation Tigers of Tamil Eelam) changed the Sri Lankan society in many ways. The Eelam War created a collective trauma. The war caused lasting symptoms of paralyzing anxiety, grief, and hopelessness among the victims. People became acquainted with new terms that have been associated with war, armed conflict and trauma. PTSD was one of the terms (acronyms rather) that emerged during the course of war. The armed clashes in Sri Lanka dates back to as far as 1972. In 1972, a group of undercover Tamil militants planted several bombs at the Duraiappah Stadium in Jaffna. In 1974, a hand bomb was thrown at the Kankesanturai Police Station. On the 27th of July 1975, the Mayor of Jaffna Mr. Alfred Duraiappah was gunned downed by the LTTE leader Velupillai Prabhakaran,The tension was escalating in the North and the security forces were repeatedly on high alert. The Eelam War started in 1983 and lasted until 2009. Over the years, the Sri Lankans saw a bloody war that destroyed thousands of lives. Many civilians as well as the members of the armed forces became the physical and psychological casualties of the war. From Independence in 1948 to until 1971, Sri Lanka had a relatively small Army that was less professional and regarded as a ceremonial army. 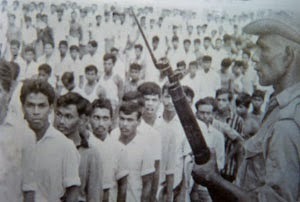 With the 1971 JVP insurgency, the Armed Forces had been mobilized for combat operations for the first time. The Northern conflict demanded more manpower to the Armed Forces. In late 1987, the army had a total estimated strength of 40,000 troops, about evenly divided between regular army personnel and reservists on active duty. The approximately 20,000 regular army troops represented a significant increase over the 1983 strength of only 12,000. Aggressive recruitment campaigns following the 1983 riots raised this number to 16,000 by early 1985. (Global Security.org). In the year 1986, the Sri Lanka Army had 30,000 personnel. By 2008, the Sri Lanka Army had force strength of 162,000. From 1981, the LTTE intensified its attacks on the security forces. In 1981, the LTTE killed two members of the Sri Lanka Army on the Kankesanturai road in Jaffna. In 1983, the LTTE ambushed a Sri Lanka Army patrol killing 13 soldiers. The LTTE launched its first suicide attack in 1987 at the Sri Lanka Army camp in Nelliady killing 40 soldiers. The Sri Lankan Armed Forces launched a number of military operations against the Tamil Tigers. 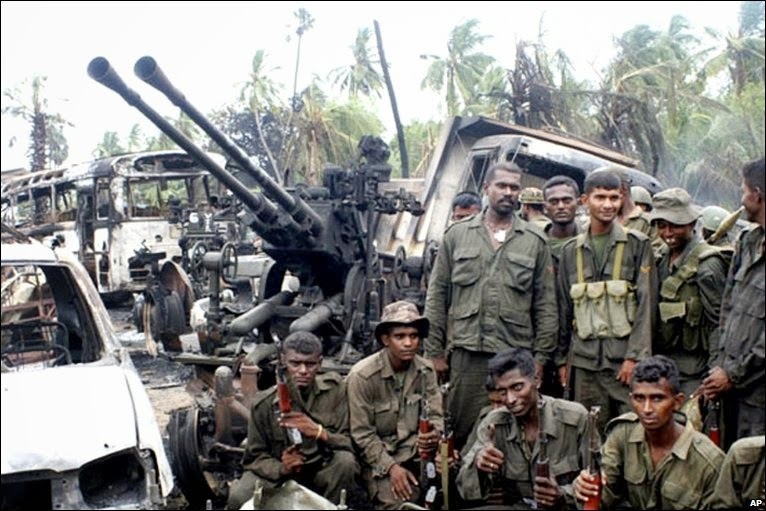 On May 26th 1987 the Operation Liberation (Vadamarachchi Operation) was launched against the LTTE. With the military conflict the number of battle casualties increased on both sides. Sri Lanka Army Medical Corps (SLAMC) treated the Army casualties. The SLAMC had skillful Surgeons and Physicians to treat the physical wounds. The recovery rate was very high. Nevertheless, since the early days of the conflict, the psychological and psychiatric supports for the soldiers were minimal. The psychological wounds of the Eelam War never became a priority. From the beginning of the Eelam War in 1983 to its end in 2009, the Sri Lanka Army did not have a single Military Psychologist to treat, evaluate or assess the mental health problems of the soldiers who faced a noxious war. Many military leaders had no specific idea about the psychological traumatic reactions of the Eelam War although there were brilliant officers who had exceptional skills in military strategy. The psychological shock that surfaced with the war was not recognized efficiently in the early days of the conflict. Sometimes these reactions were disregarded or suppressed as acts of cowardice or acts of indiscipline. A few Officers who had profoundly read about the Vietnam War suspected possible Vietnam Syndrome appearing in the Northman war front. A constable returned from Jaffna has unusual fears about Tiger gunmen who did several killings in the North. He became extremely frightened after hearing Inspector Bastianpillai’s death. He is unable to sleep and has nightmares about gunmen who travel by bicycles and shooting the Policemen in Jaffna. He is imploring a transfer to his hometown in Tangalle. In my opinion, he is unfit to serve. There were many psychological reactions related to the armed conflict in the North. In the early days of the War (1984) one Lieutenant of the Sri Lanka Light Infantry serving in Jaffna noticed irritability, fatigability, lack of appetite and mood swings among some of his platoon members. After many years, he described the situation as tense and intolerable. In 1985, the Tamil Tigers opened fire indiscriminately with automatic weapons killing and wounding hundreds of civilians in Anuradhapura. 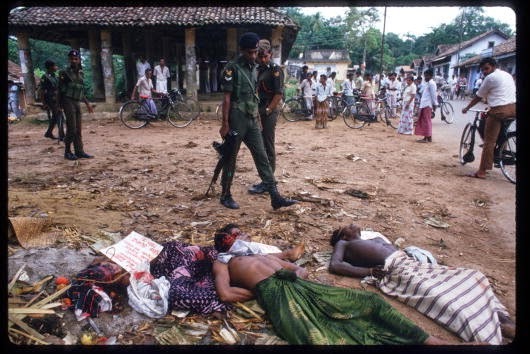 After this infamous massacre, Tamil civilians living in Anuradhapura fled to Army camps for safety reasons. 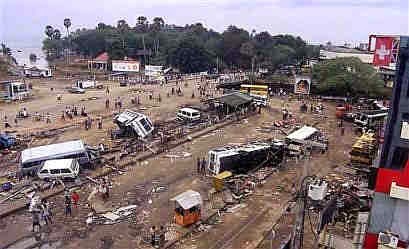 One soldier became so outrageous and could not control his anger over the Anuradhapura massacre. At the camp, he suddenly opened fire and killed several Tamil civilians. His superior officer had to shoot him in order to stop the furious rampage. The battle stresses were affecting the officers and soldiers. It was affecting discipline and military performance. When the conflict intensified, many soldiers became physically wounded. Some had psychological wounds but these stress related reactions were not considered serious as physical wounds. Within a few years, the psychological casualties of the Eelam War gradually started to grow. Desertion, disciplinary infractions, self-harm and suicides became huge problems. The desertion rate in the Sri Lankan armed forces became highest in South Asia. The military conflicts in Korea, Vietnam, and Iraq etc. have proven with increasing numbers of civilian casualties and the Eelam War was no exception. People became victims due to collateral damage. Many civilians in the North became displaced as a result of the armed conflict. The civilians exposed to war trauma experienced a continued threat to life and their sense of safety, as well as a disruption of daily functioning. A large number of psychological casualties have been reported among the civil population in the North. Professor Daya Somasundaram of the University of Jaffna took major initiative to identify and treat the war victims. His 1998 publication Scarred Minds was an eye opener and is narrated by the victims diagnosed with PTSD. Henceforth, the clinical community started debating on PTSD in Sri Lanka. The military conflict was spreading across the other areas. Within a short period, the Sinhala and Muslim villages in North Central Province became a target of the LTTE. The LTTE carders massacred a large number of civilians in these villagers. The survivors became psychologically horrified. When the Eelam War took to a new direction the civilians from the South too experienced war related anxiety reactions following the LTTE suicide bombings and the air attacks. While manmade disasters created a collective trauma in Sri Lanka, another tragedy occurred. 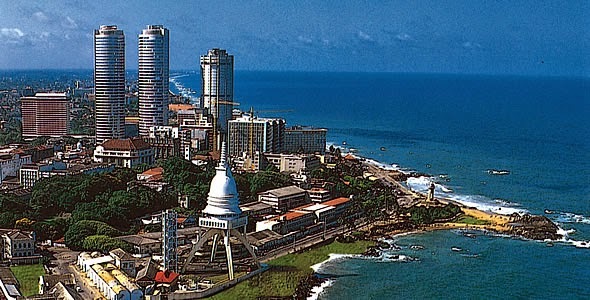 In 2004 Sri Lanka was struck by a gigantic Tsunami wave that killed over 30, 000 people. The country was virtually paralyzed by this natural disaster. The 2004 Tsunami disaster generated a significant numbers of victims with PTSD. Sri Lanka received material aid from many countries and teams of foreign medical experts visited the displaced communities. They found a number of PTSD victims and again the clinical communities started discussion about the validity of PTSD. Nonetheless, many local clinicians realized that the PTSD is not totally an American illness. Dr. Neil J Fernando – Consultant Psychiatrist of the Sri Lanka Army diagnosed and treated a considerable number of PTSD victims in the armed forces. He became one of the initiators to address war trauma at the National level. PTSD or Posttraumatic Stress Disorder is a cluster of psychological Symptoms that can follow a psychologically distressing event. The typical symptoms of PTSD occur after recognizable stress or traumatic event that involved intense fear and horror. PTSD denotes an intense prolonged and sometimes delayed reaction to an extremely stressful event. 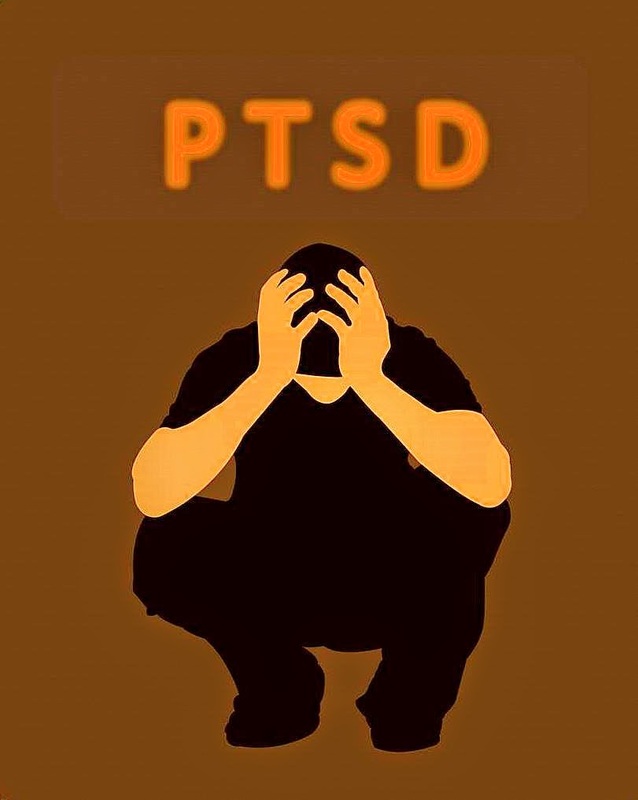 The Columbia University Encyclopedia describes post-traumatic stress disorder (PTSD) as a mental disorder that follows an occurrence of extreme psychological stress, such as that encountered in war or resulting from violence, childhood abuse, sexual abuse, or serious accident. The stressful event is usually followed by a period of emotional numbness and denial that can last for months or years. After that period, symptoms such as recurring nightmares, “flashbacks,” short-term memory problems, insomnia, or heightened sensitivity to sudden noises may begin. In some cases, outbursts of violent behavior have been observed. The diagnosis of PTSD first appeared in 1980 in the DSM or Diagnostic and Statistical Manual of Mental Disorders. According to the DSM -4 PTSD has been described as an Anxiety Disorder and the essential feature of Posttraumatic Stress Disorder is the development of characteristic symptoms following exposure to an extreme traumatic stressor involving direct personal experience of an event that involves actual or threatened death or serious injury, or other threat to one's physical integrity; or witnessing an event that involves death, injury, or a threat to the physical integrity of another person; or learning about unexpected or violent death, serious harm, or threat of death or injury experienced by a family member or other close associate. Post-traumatic stress disorder is marked by clear biological changes as well as psychological symptoms. These symptoms can impair the suffer’s daily life massively. It is associated with impairment of the person’s ability to function in social or family life including occupational instability, cognitive problems, marital problems and difficulties in parenting. PTSD is complicated by the fact that it frequently occurs in conjunction with depression, alcohol and substance abuse. After the independence in 1948, Sri Lanka experienced a series of man made and natural disasters that affected the mental health of the population. These disasters had caused an immense psychological damage. Most of the posttraumatic reactions were not identified or not diagnosed and sufferers lived with the symptoms for a long time sometimes in their entire life span. The 1971 uprising that was led by the JVP or the People's Liberation Front made an unsuccessful attempt to overthrow the Government by launching an island wide attack of the Police stations. According to K.M. de Silva a renowned historian 1971 JVP insurrection perhaps, the biggest revolt by young people in any part of the world in recorded history. After the 71 insurrection, the Government appointed a team of experts to rehabilitate the young rebels, headed by Dr. Leel Gunasekara who did a commendable service. Their psychosocial needs were addressed and a large number of suspects were successfully rehabilitated. Today the participants of the 71 insurrection lead productive lives and 95% them did not participate in the 2nd revolt in 1988/89. During 2008 - 2009, I had interviewed over 100 ex rebels of the 71 uprising and it was revealed that some are still experiencing the posttraumatic reactions even after 38 years of the 71 insurrection. Many of them have intrusions, distrust, avoidance and emotional numbing. 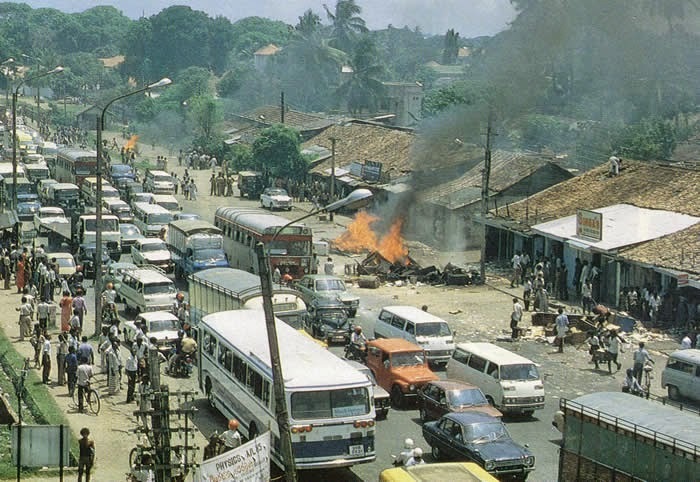 In July 1983, communal riots broke out following the ambush and killing of 13 Sri Lankan Army soldiers including Lt Vass Gunawardana in Tinnevely Jaffna. Soon after this incident, the mob attacked the Tamil civilians killing and looting their property. The communal riots in 1983 created a massive collective trauma and many victims suffered posttraumatic stress. After the 1983 riots, a large number of traumatized youth joined various Tamil militant groups and fought against the Government Forces. Tens of thousands fled to Western Countries and to India. Thousands are still living with the posttraumatic memories of the 83 racial riots. JVP launched its 2nd Insurgency during the time 1988/89 which cost the lives of over 60,000 people. The 88/89 terror period marked by killings of civilians as well as destruction of national assets. Unspeakable atrocities were committed against humanity during this terror period and the nation went through its darkest phase. The Insurgency in 1988/89 created a bulky numbers of PTSD in the country. Some psychological studies indicate that a vast amount of victims as well as perpetrators of the 88/89 insurgency suffer from malignant PTSD. Another study done by Miriam J.J. Lommen Angelique J.M.L. Sanders and Nicole Buck (Maastricht University, Maastricht, The Netherlands) included 113 survivors of the 2004-tsunami on the south coast of Sri Lanka. The results indicated that fifteen months post-trauma the prevalence of PTSD was 52.2%. Sri Lanka received numerous aids to combat the Tsunami disaster and psychological assistance offered by the EMDR HAP was commendable. A team of experts led by Dr Nancy Errebo treated a large number of psychological victims of the 2004 Tsunami Disaster in Sri Lanka. Sri Lankan conflict was one of the longest armed conflicts of the 20th centaury. Sri Lankan society was shattered by hate and brutalization as a result of the internal war which caused over 95,000 lives and destruction of property worth over billions. This prolonged conflict generated massive numbers of PTSD victims. Combatants as well as a large numbers of civilians including members of the LTTE had undergone a tremendous amount of stress for the last three decades. The civilians of the Northern Sri Lanka witnessed the War in firsthand. Many became the victims of the collateral damages. Prof Daya Somasundaram in the Journal of Mental Health Systems 2007 estimates that 14% of the Tamil population living in the Northern Sri Lanka suffer from PTSD. Many civilians in the endangered villages and in the South became physical and psychological casualties following the attacks conducted by the LTTE aiming civilian targets. There had been large military operations where the combatants were directly exposed to hostile conditions. Many combatants suffered combat trauma. The shock wave of combat still echoes the Sri Lankan society. Although the war is over the psychosocial scars of the war will remain for a long time. There are no empirical data that directly address the prevalence of PTSD among the Sri Lankan combatants. But the 3 year study (2002-2005) done by the author with the Consultant Psychiatrist of the Sri Lanka Army Dr. Neil Fernando reveals that combat related PTSD is emerging in Sri Lanka. In one separate study which was done with the 824 Sri Lankan combatants who were referred to the Psychiatric ward Military Hospital Colombo, , full blown symptoms of PTSD was found among 56 people. PTSD diagnosed done according to the DSM 4. Based on our rough estimations 8% - 12 % of combatants are severely affected by combat stress and many of them are not under any type of treatment. According to our survey among the 824 combatants who were referred to the Psychiatric Unit Military Hospital Colombo from August 2002 to March 2005 found a prevalence of conditions like PTSD (6.8%) depression (15.6%) alcohol abuse (3.5%), Somatoform Disorders (7.89%) and psychiatric illnesses such as Schizophrenia, Bipolar Affective Disorder, Acute Transient Psychotic Disorders etc (9.4%). This may be the tip of the ice burg that is visible yet. This sample was referred to the Military Hospital Colombo for various psychiatric as well as stress and anxiety related conditions. Although this was not a randomly selected field sample it includes combatants who were exposed prolonged combat trauma. Over 95 % of the participants were on active duty. This survey discloses the bitter truth about the war and effective measures would be needed to prevent further damage. A traumatized soldier can transform his stresses to his family and to the community. Hence, in the long run the whole country will be affected by the repercussions of combat stress. This would lead to a vicious cycle and the scares will remain for decades. The American Psychiatric Association (2000) discusses risk factors that affect the likelihood of developing PTSD. Among the risk factors the severity, duration, and proximity of an individual’s exposure to the traumatic event are the most important factors affecting the likelihood of developing this disorder. The researches indicate that social support, family history, childhood experiences, personality variables, and preexisting mental disorders may influence the development of posttraumatic Stress Disorder. It can develop in individuals without any predisposing conditions, particularly if the stressor is especially extreme. There were several risk factors that affected the Sri Lankan combatants and it played a crucial role in developing combat related PTSD. The authorities did not welcome the term PTSD for a long time and they considered PTSD as an American illness that cannot be found in Sri Lanka. Therefore, psychological management of combat stress was not in the priority list during the 30-year war. Unfortunately, combat stress was not identified as a vital factor that should be dealt with effectively. The authorities felt that talking about combat stress could affect the soldier’s morale. Many filed military doctors disregarded psychological wounds of the war and gave immense attention to the physical wounds. Lack of experts in military psychology as well as the lack of funds has made psychological trauma management painstakingly difficult. Some of the socioeconomic factors too contributed high rates in PTSD following combat related stress. During the height of the war, youth from the lower socio economic levels joined the Army and some of them had faced severe economic hardships, affected by the Middle East syndrome (maternal deprivation) or subjected to childhood trauma. Their psychological makeup had been changed negatively and they were psychologically vulnerable. Our 2002 – 2006 combat related PTSD study revealed that among the 56 Sri Lankan combatants who suffered from PTSD 30 of them had experienced childhood trauma such as chronic maternal deprivation, physical and sexual abuses, neglect etc. during the childhood. As Gen Gerry De Silva- the former Commander of the Sri Lankan Army points out, the Sri Lanka army was the only army in the world whose full binate strength had been mobilized for over three decades. A large number of soldiers had served in the operational areas for 10-15 years facing hostile combat events. These factors had increased the psychological casualties in the military. Even though the Eelam War was over by 2009, the psychological aftermath of the war has not ceased. Today we see the psychological reverberations of the Eelam War in our society. Murders, suicides, rapes and child abuses, elements of social unrest, religious fundamentalism, inter-ethnic / religious tensions etc. have been increased over the past few years. There is a sense of alienation; mistrust and culture of silence prevailing in the post war Sri Lankan society. The psychological aftermath of the Eelam war is detrimentally affecting people and it would impact future generations unless we take appropriate measures to heal the Nation. I personally believe that I have certain unexplained things in my mind, which I have got from battle field during 1998 - 2000 period. According to the Army all Military personnel will be faced for a full medical inspection before they will release from Army . However in Sri Lanka Army no action will take place to check their mental health.